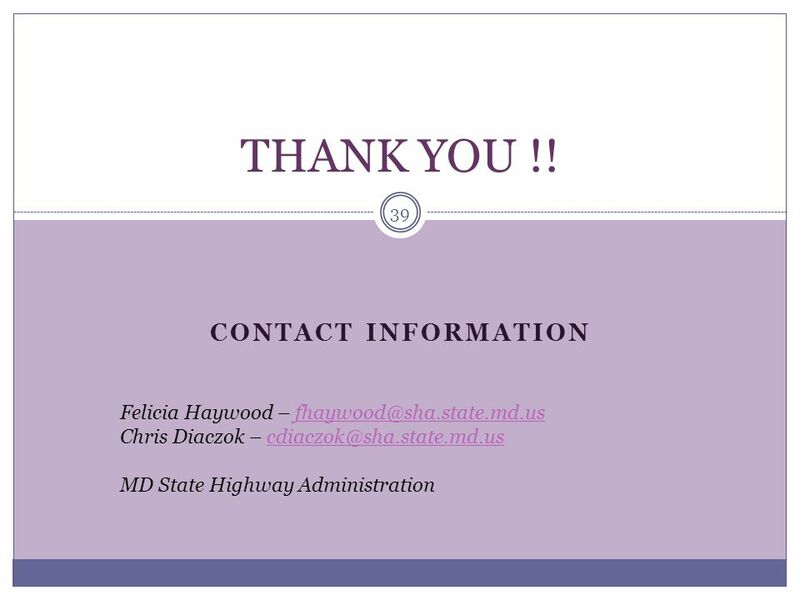 2 Presentation Outline About Maryland and State Highway Admin. 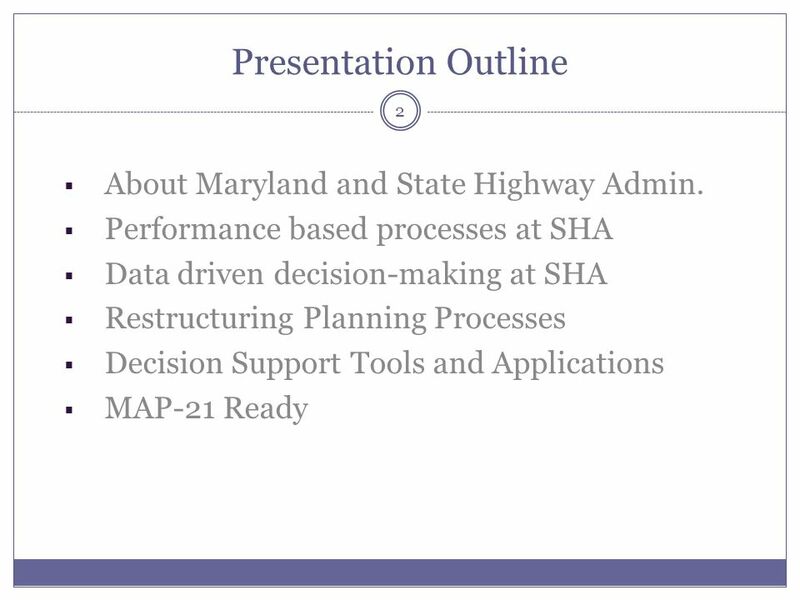 Performance based processes at SHA Data driven decision-making at SHA Restructuring Planning Processes Decision Support Tools and Applications MAP-21 Ready We’ve got two of us here today from MDOT’s State Highway Administration. Felicia Haywood is Deputy Director of our Office of Planning and Preliminary Engineering, and she will share with you a bit more about her responsibilities. My name is Chris and I am a Policy Analyst within our Office of Policy and Research. 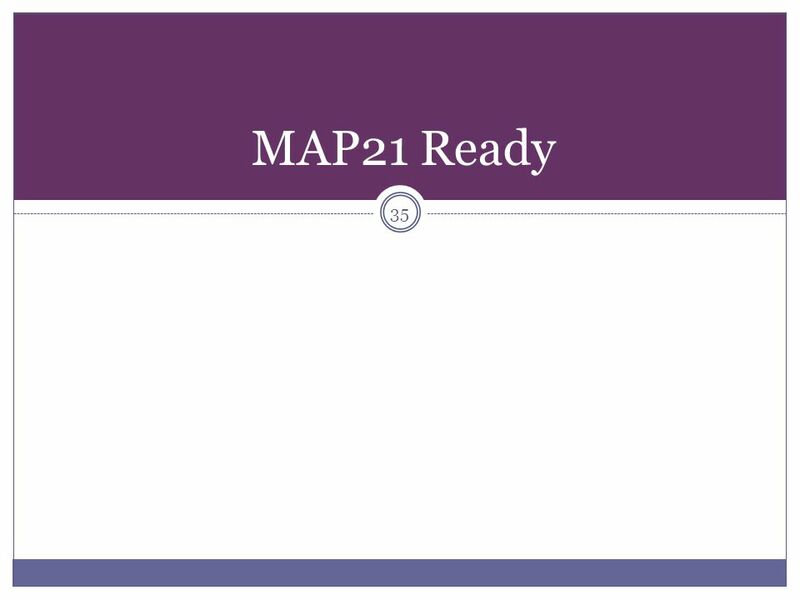 I will give the first part of our presentation; mostly background information on our agency and program. Felicia will talk about the more technical aspects of the program. 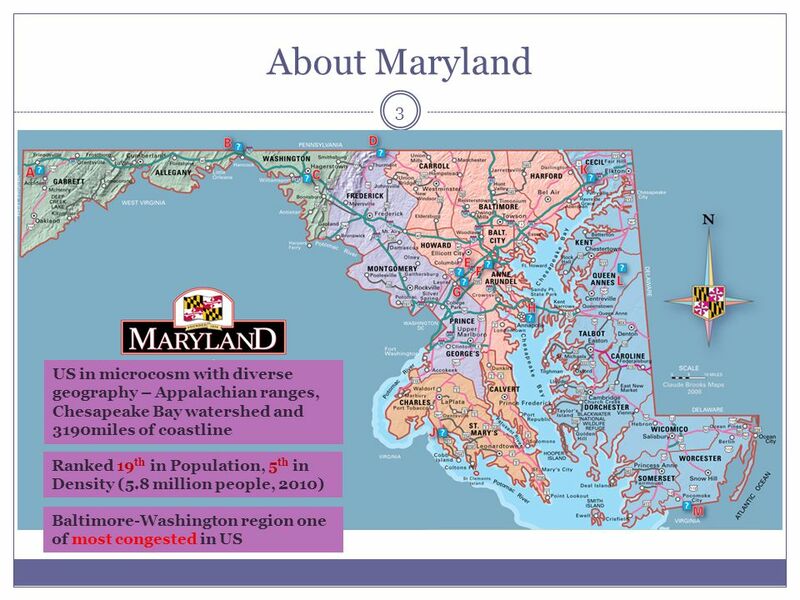 MDOT has direct supervision over all aspects of transportation in the State of Maryland. 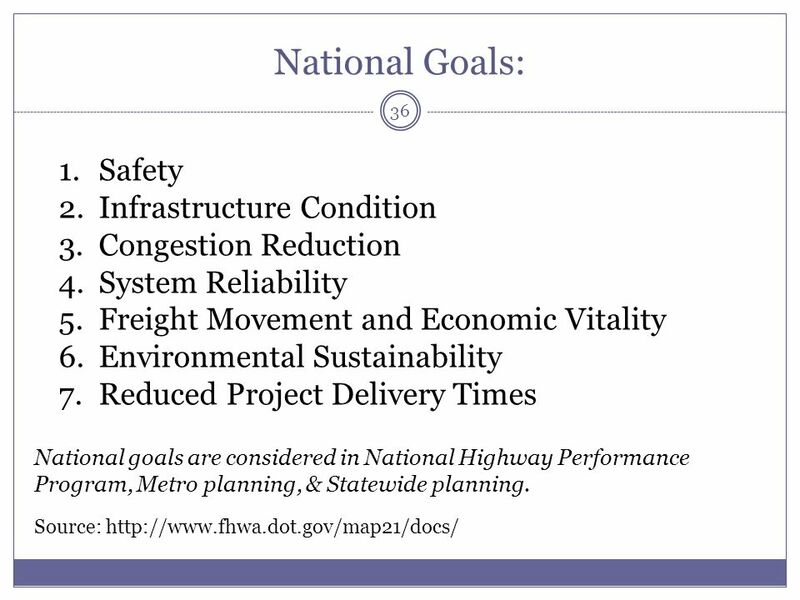 $3.6 billion annual budget funded through a common state Transportation Trust Fund. 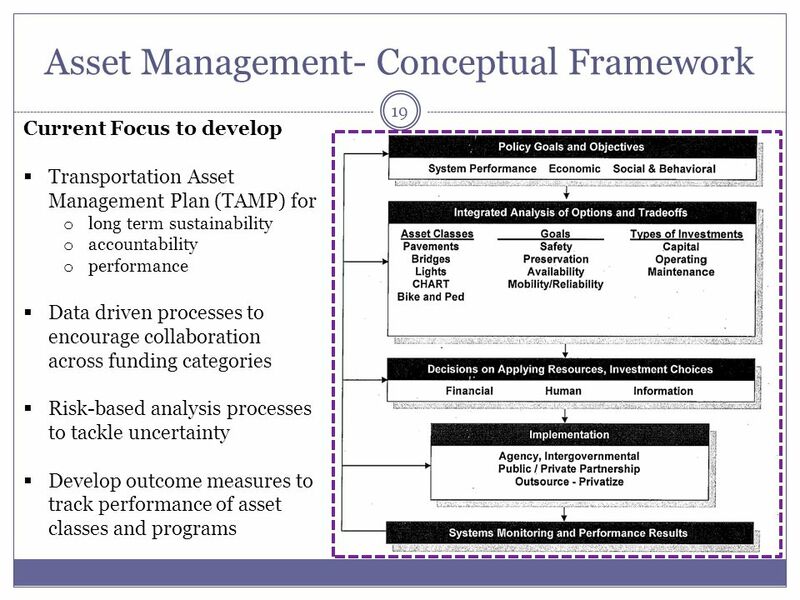 Funds two major urban transit systems, MTA in the Baltimore region and the WMATA in the Washington region. MTA served 415,000 riders/ weekday in 2011. Port of Baltimore is the fastest growing port in the US . One of the few deep water east coast ports to handle Large vessels (expected after Panama Canal Expansion) BWI Airport served more than 22.4 million passengers in Ranked 6thin the nation for customer service and convenience by Travel & Leisure Magazine. 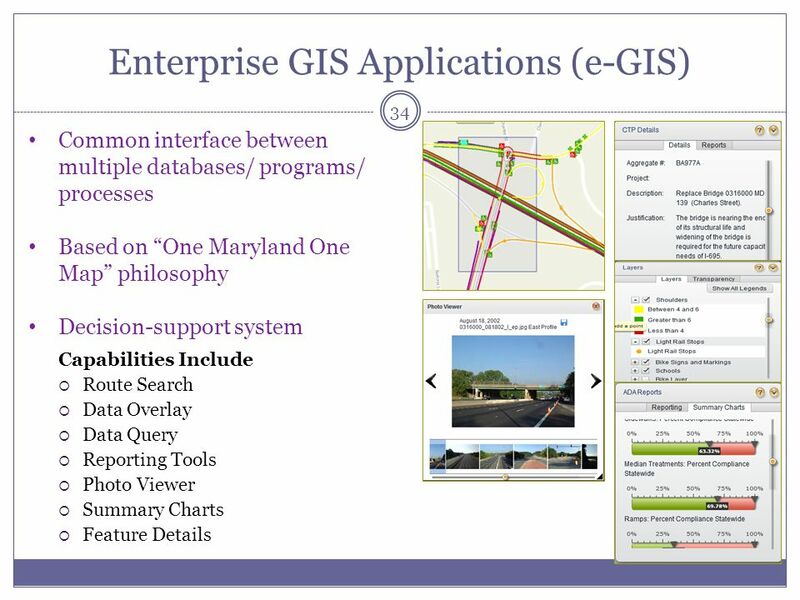 Maryland Department of Transportation is a modal administration, where all modes of state-owned and operated transportation are housed within one Department. 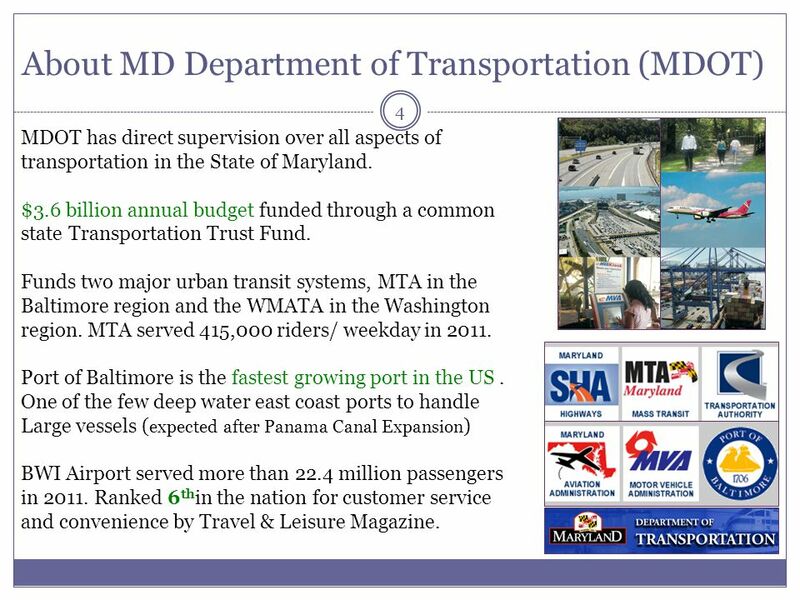 We have the: Maryland Transit Administration (buses, light rail, commuter trains, and some short-line rails); Maryland Port Administration, which manages the Port of Baltimore; Maryland Aviation Administration, which manages airports, most notably the Thurgood Marshall Baltimore-Washington International airport; Maryland Transportation Authority, which manages the state’s tolled facilities; Maryland Vehicle Administration, which manages vehicle title and registration activities, etc; Maryland State Highway Administration, which operates the state-owned mileage within Maryland, carrying much of the VMT. 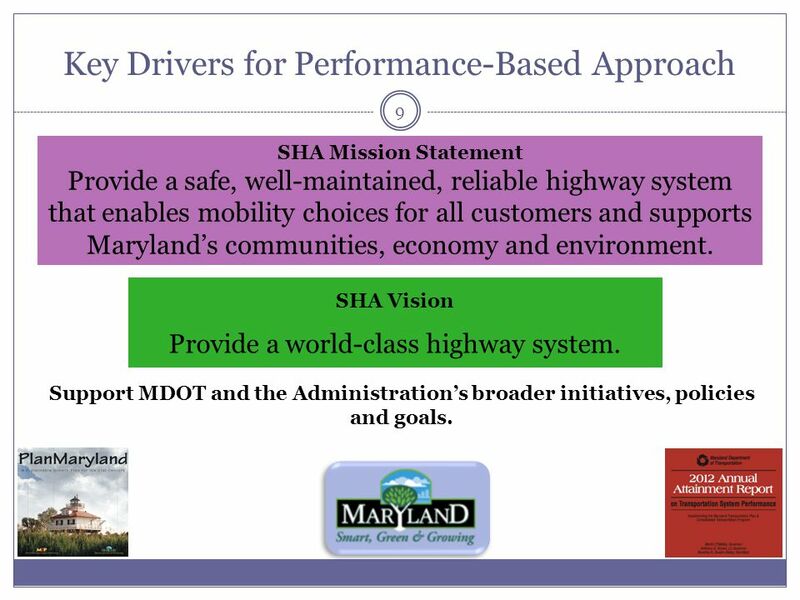 One of the six modals of the MDOT SHA system is the backbone of MD’s transportation system that provides mobility and access for people and goods. 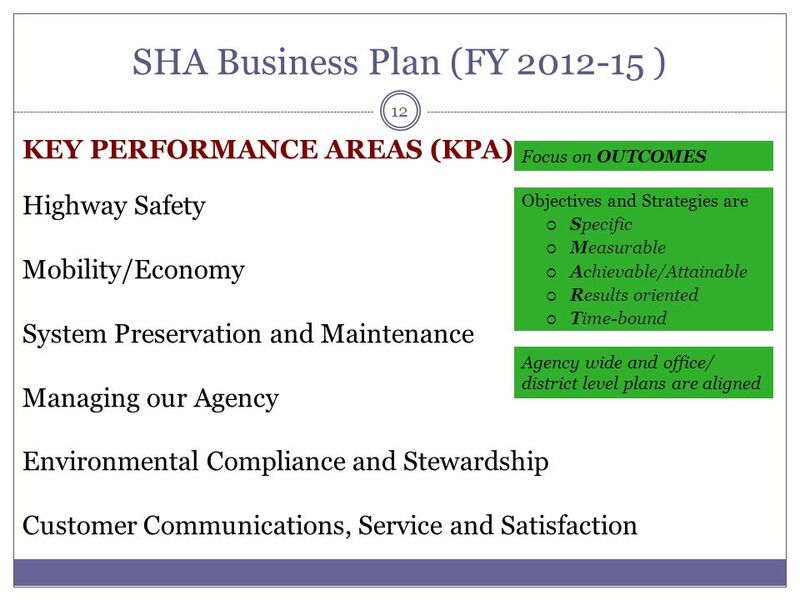 SHA operates, maintains and rebuilds the numbered, non-toll routes. 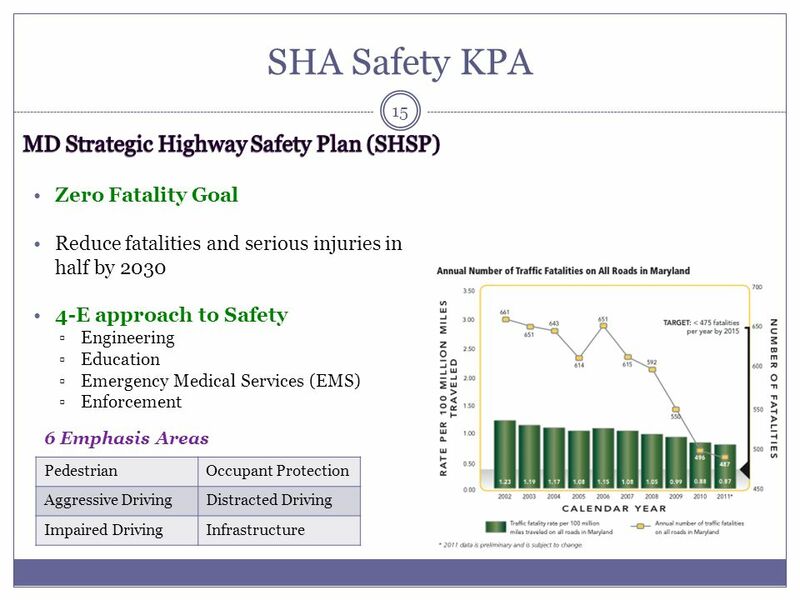 SHA roads carry 65% of the state’s traffic and 85% of its truck freight. 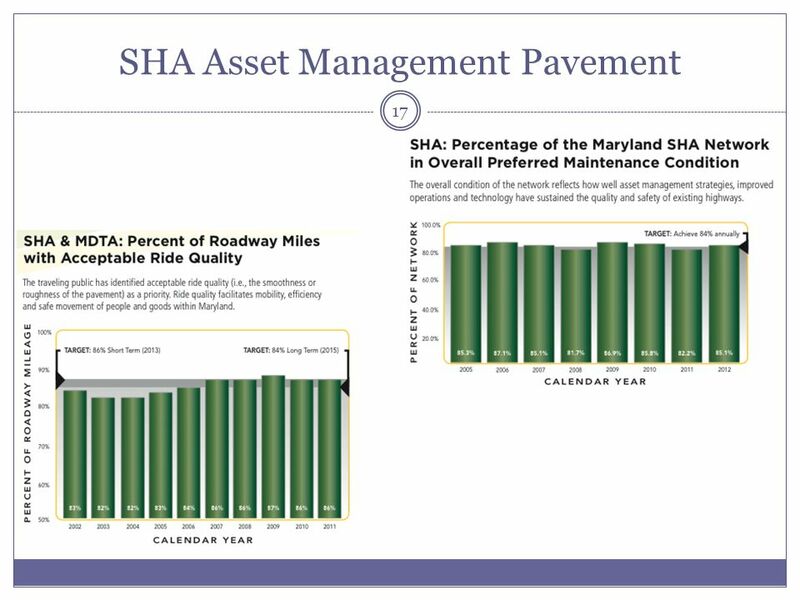 FY 11 Funding: $1.15 Billion SHA maintains about 17,000 lane-miles and 2,576 bridges in all 23 counties (but not in Baltimore City). Which is about 20% of lane mileage statewide, but carries about 65% of VMT. The FY11 funding program mostly went for system preservation activities. 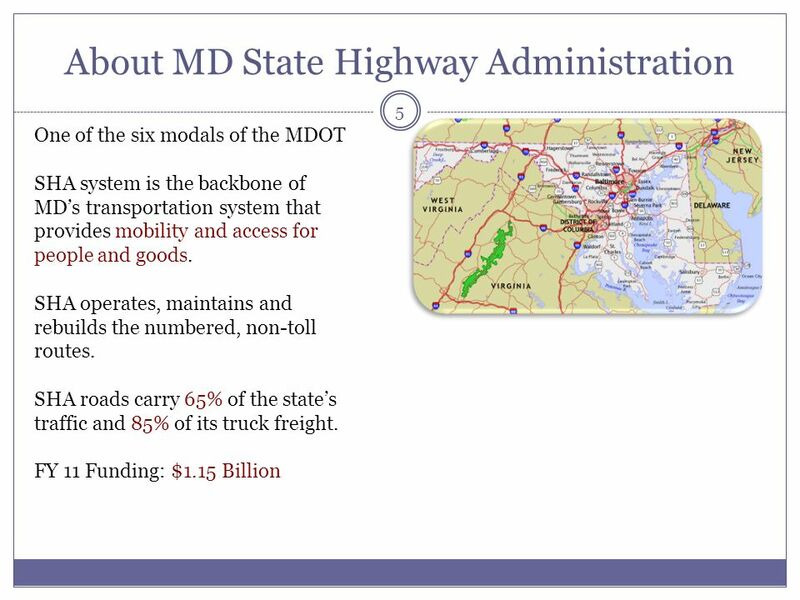 However, the state legislature did just pass a new transportation funding structure which will infuse almost $800 million more a year into Maryland’s dedicated Transportation Trust Fund. 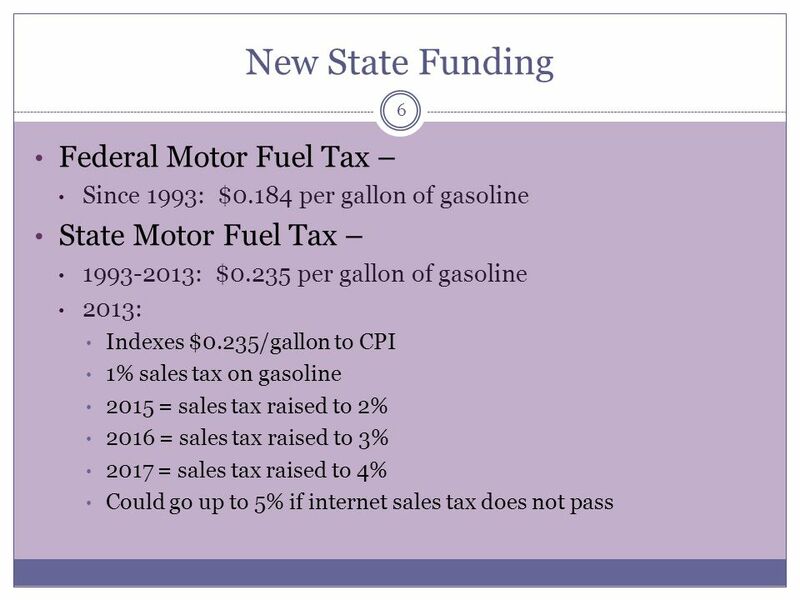 Since 1993: $0.184 per gallon of gasoline State Motor Fuel Tax – : $0.235 per gallon of gasoline 2013: Indexes $0.235/gallon to CPI 1% sales tax on gasoline 2015 = sales tax raised to 2% 2016 = sales tax raised to 3% 2017 = sales tax raised to 4% Could go up to 5% if internet sales tax does not pass -In case anyone wants to see that new structure, here it is……the current rate is indexed to the Consumer Price Index and a 1% sales tax on gasoline was added, and will rise yearly for 3 years. 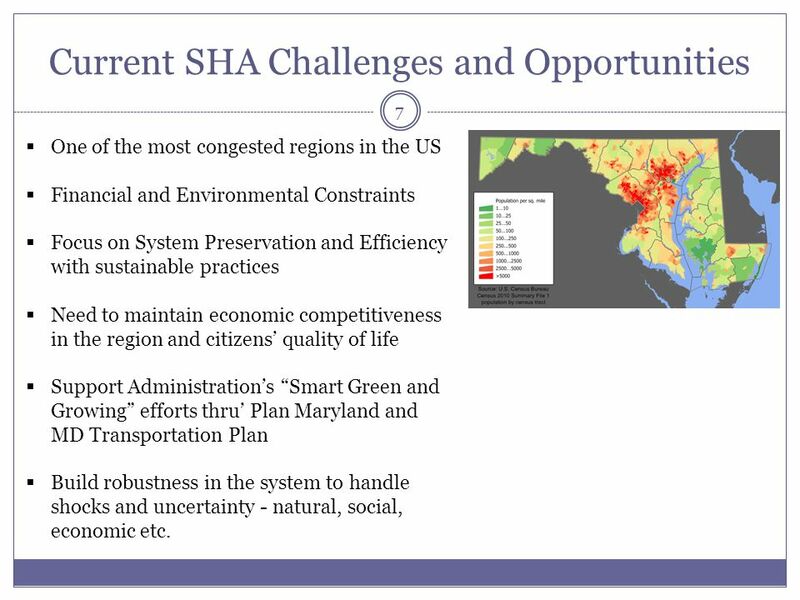 One of the most congested regions in the US Financial and Environmental Constraints Focus on System Preservation and Efficiency with sustainable practices Need to maintain economic competitiveness in the region and citizens’ quality of life Support Administration’s “Smart Green and Growing” efforts thru’ Plan Maryland and MD Transportation Plan Build robustness in the system to handle shocks and uncertainty - natural, social, economic etc. 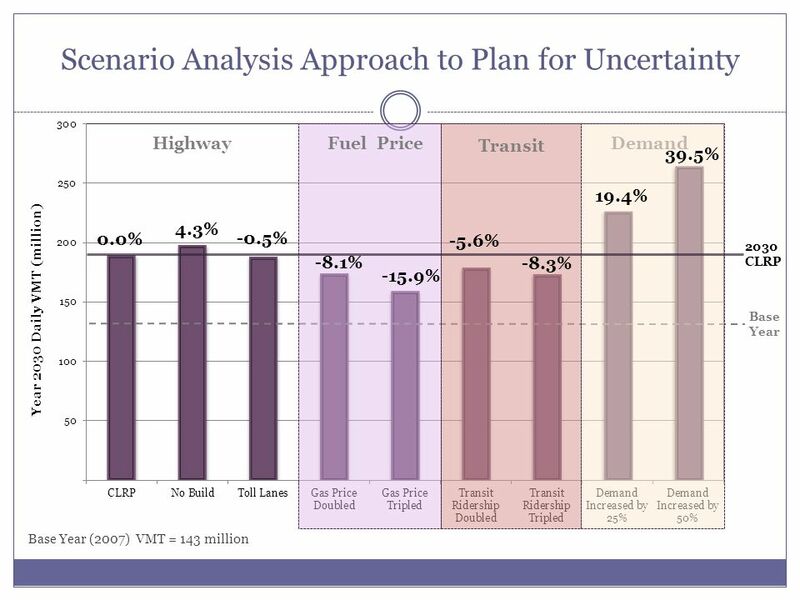 The Texas Transportation Institute’s 2012 Urban Mobility Report listed Washington DC as one of its most congested corridors. 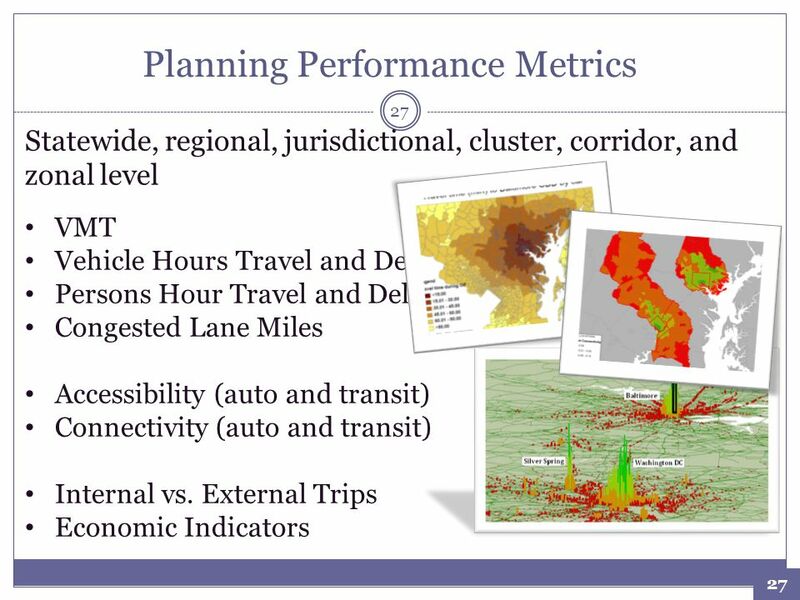 While many might not agree with TTI’s methodology, we do agree that the Washington DC-Baltimore Corridor is very congested. Financial Constraints are affecting every state. And, before the increase in the State’s gas tax structure that just passed, SHA shelved roughly half of its Transportation Program since 2009. 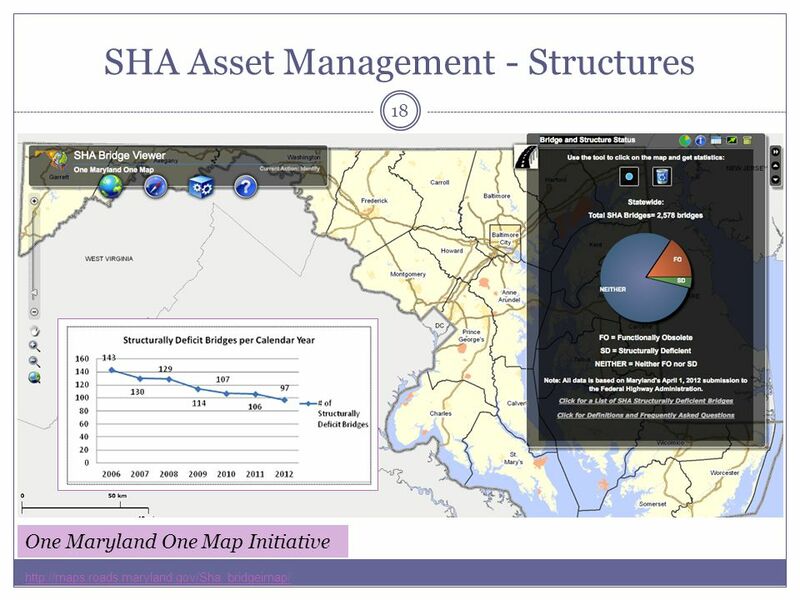 Environmental constraints include the Chesapeake Bay, for which the Legislature passed an Impervious Surface tax this past session – being called the “rain tax” – not to mention our state’s Stormwater Management Act of This Act allowed for the implementation of more current and stringent environmental site design techniques in stormwater management practices. 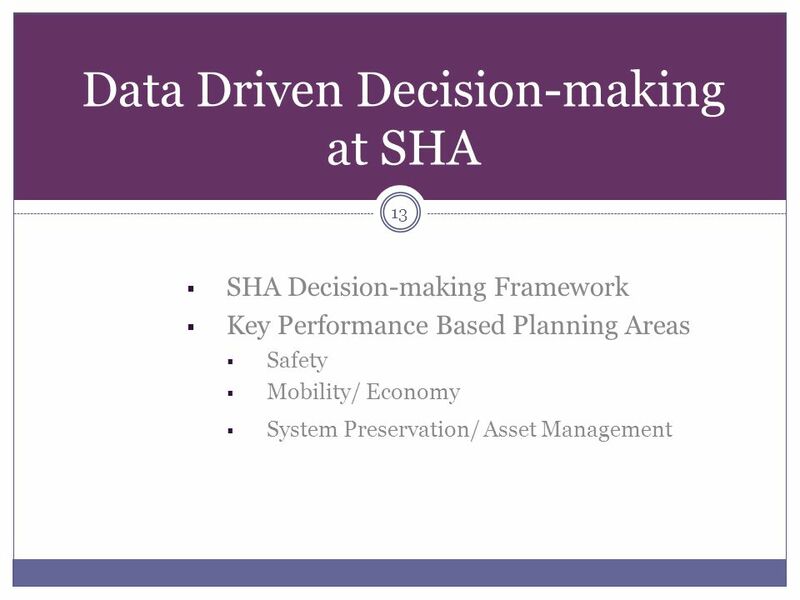 SHA, with its Asset Management system already in place, our overall program then became primarily focused on system preservation and efficiency, with sustainable practices. Created in 2009, Smart, Green & Growing is a resource for citizens, businesses, organizations, and governments to find “green” information and services, a gathering place to share sustainable ideas, a tool to track state progress. It looks at adopting smart growth policies and growing green jobs, among other activities to help us make informed choices, both about the kind of future we envision for our State and the actions we must take to realize that vision. 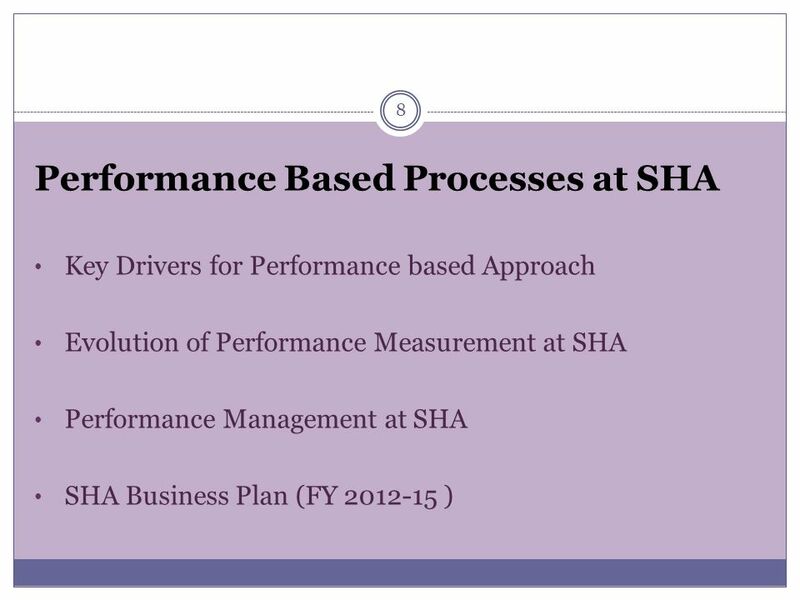 Key Drivers for Performance based Approach Evolution of Performance Measurement at SHA Performance Management at SHA SHA Business Plan (FY ) In the following section, I will talk about the different activities that have helped lead us to where we are now…. 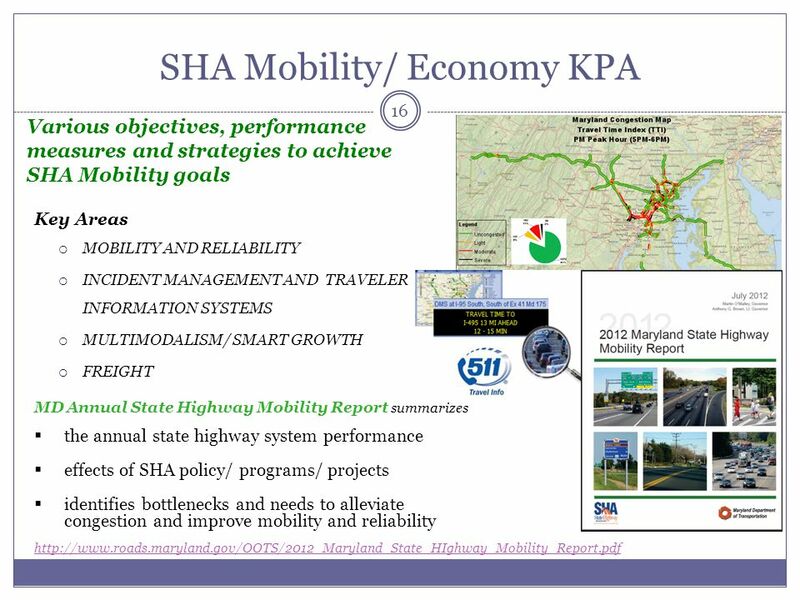 SHA Mission Statement Provide a safe, well-maintained, reliable highway system that enables mobility choices for all customers and supports Maryland’s communities, economy and environment. 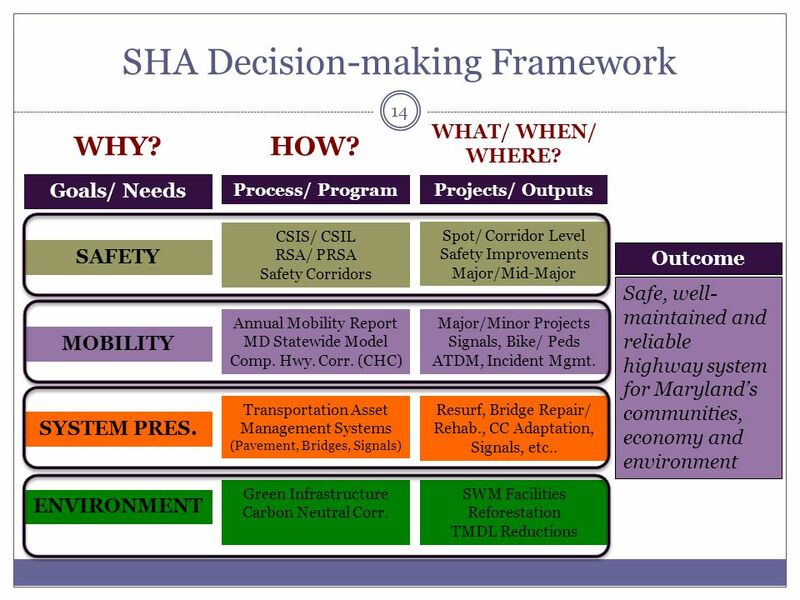 SHA Vision Provide a world-class highway system. 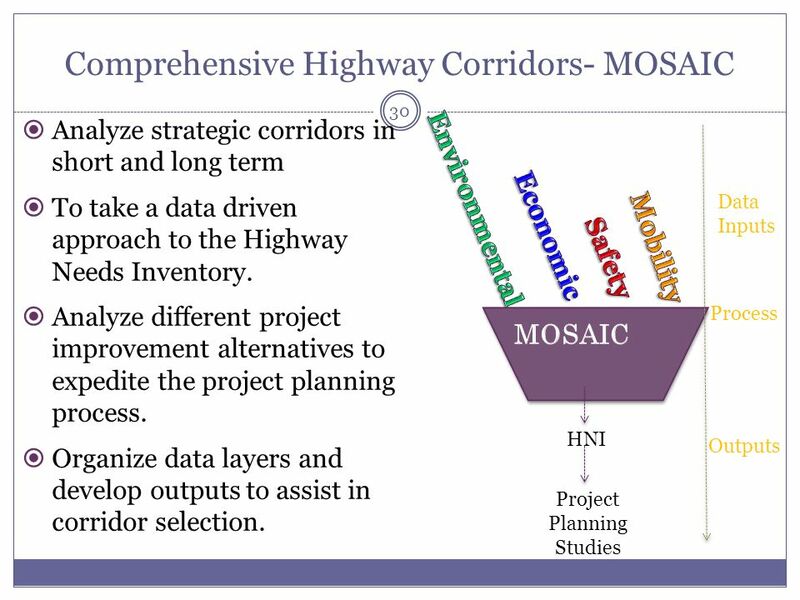 Support MDOT and the Administration’s broader initiatives, policies and goals. 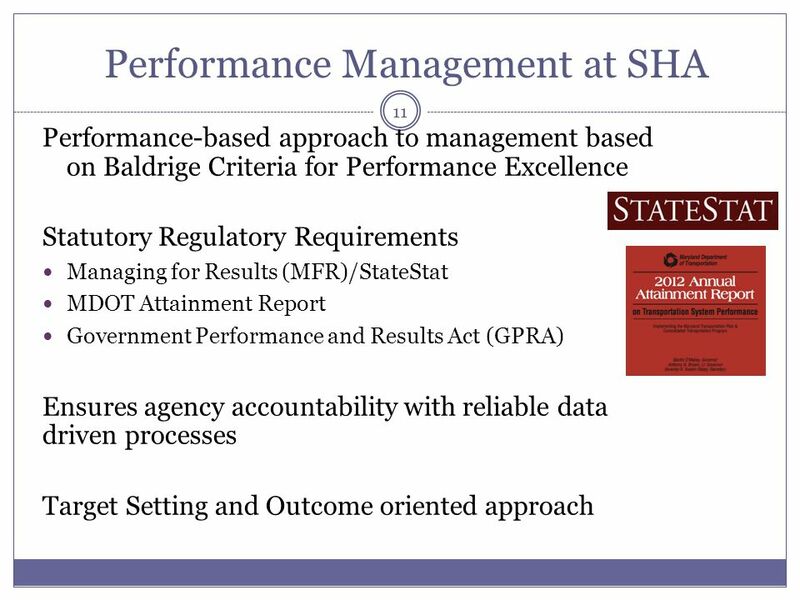 There are many reasons why state DOTs should want to implement an Performance-based approach to transportation, more than just “it’s the right thing to do” or “it was a legislative mandate.” It is both those things, but it is also because of the need to manage the public’s resources more effectively and efficiently, and more transparently, especially in a time of reduced…well, everything. Since we are governmental agencies without real competition to spur us into specific actions, the surrogate for competition is high expectations. The best place to get those expectations is from the people you serve. Simply put, their goals should be our goals. Some of the important and more specific drivers that have lead us to embrace this approach as an agency include: -Reputation – Sustainable performance fosters a strong reputation, which can have a significant effect on an agency’s trust with the public it serves. -Operational efficiency - Not addressing sustainability concerns (including customer needs, legislative requirements, employee engagement, etc) raises the risk of operational disruption. 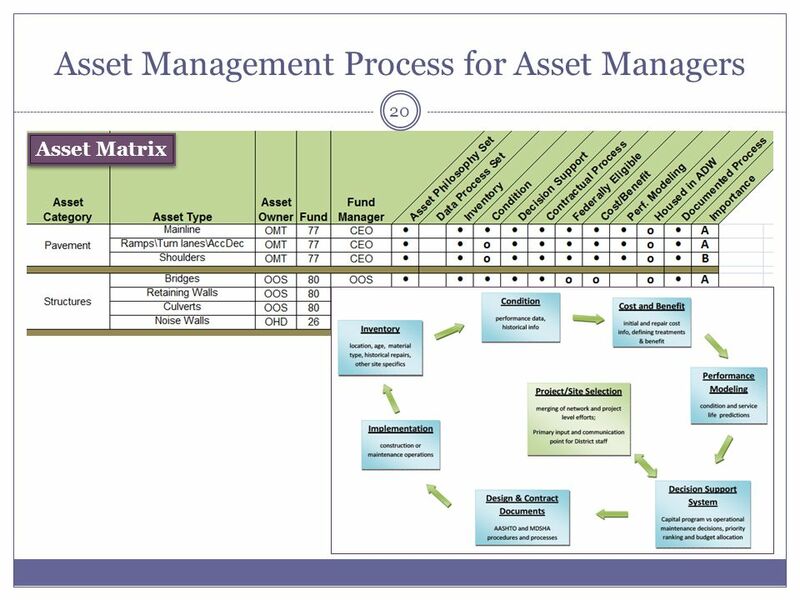 -Financial efficiency – Appropriately managing sustainability risks can result in cost savings achieved through improved performance of our assets (resulting in fewer fatalities, accidents, non-compliance issues, among other things). -Improved employee morale and retention – There are studies showing a company’s environmental and social performance affects employee turnover rates. After thinking about these kinds of things we can implement an approach that does not just merely focus on what can be easily measured. 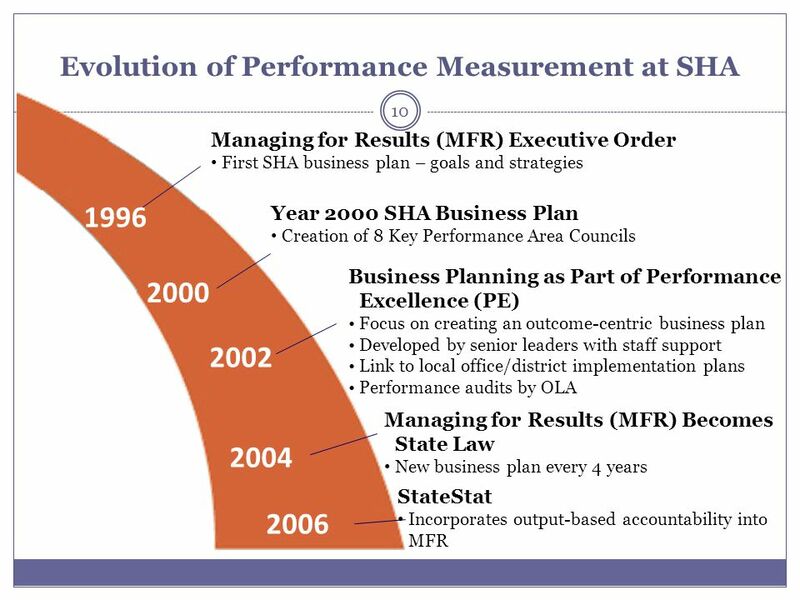 This entire effort is about recognizing performance, based not on what we can measure, but on what we want to achieve. State Roads Impacted State Structures Impacted 2 feet 156 miles – 2% 93 (3.5%) 5 feet 371 miles – 4.5% 132 (5.0%) SHA maintains 8,124 miles of roadway and 2,578 structures 103 miles of state highways in 100-year floodplain, 413 miles in 500-year floodplain FEMA 100-Year Floodplain indicates 28% of SHA Structures need further impact evaluation SHA maintains 8, miles of roadway Total structures – 2,578 The impact is not just on new design and construction, but the challenge lies in managing existing infrastructure. 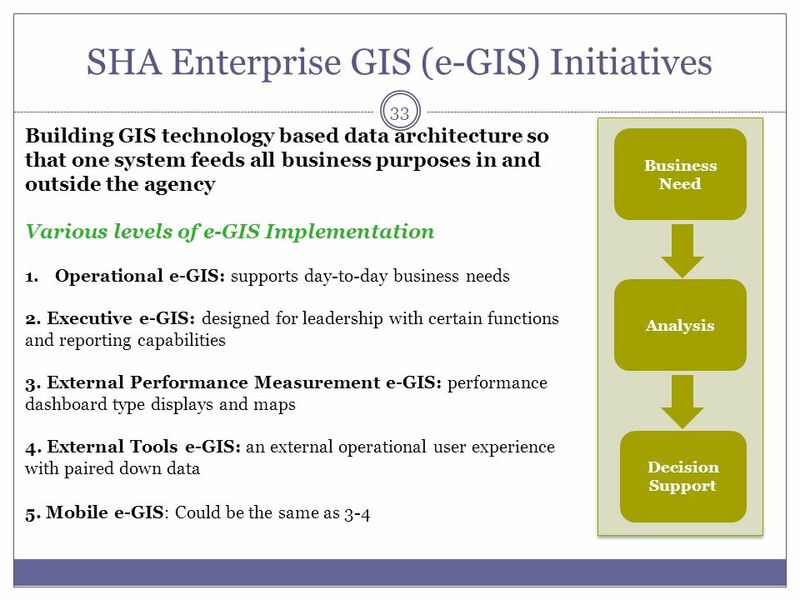 Further research needs to be done regarding height of 727 structures using FEMA 100-yr data SHA just received funding through a FHWA pilot program to perform an Adaptation Study with Detailed Vulnerability Assessment. 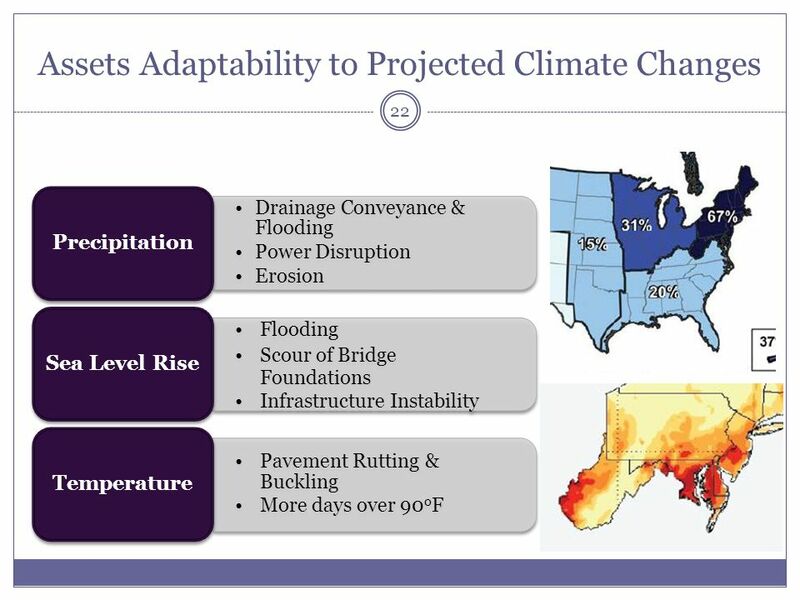 It’s purpose is to conduct, in partnership with appropriate agencies and jurisdictions, an assessment of asset resilience to climate change effects and extreme weather. 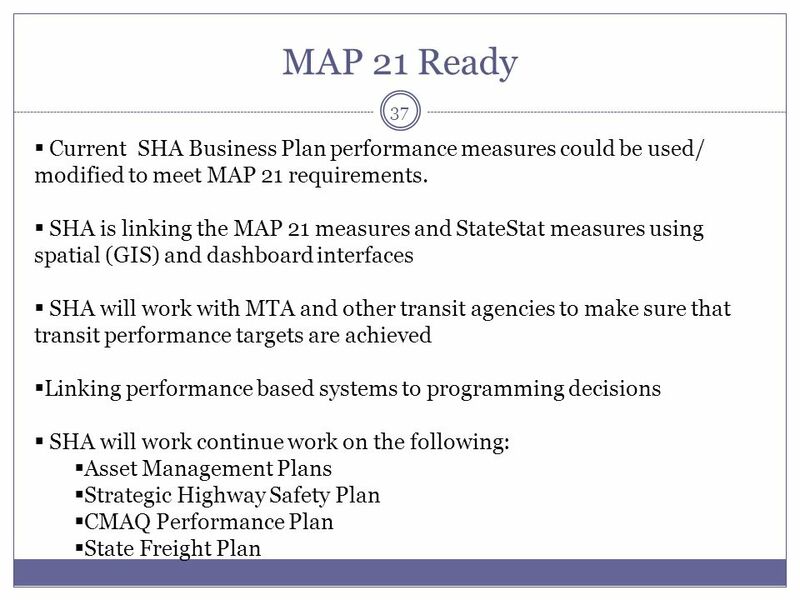 This analysis will also be done in conjunction with a more refined statewide vulnerability assessment of a certain class of assets that will enable transportation planners across the State to improve vulnerability risk assessment practices and to help shape effective adaptation strategies. 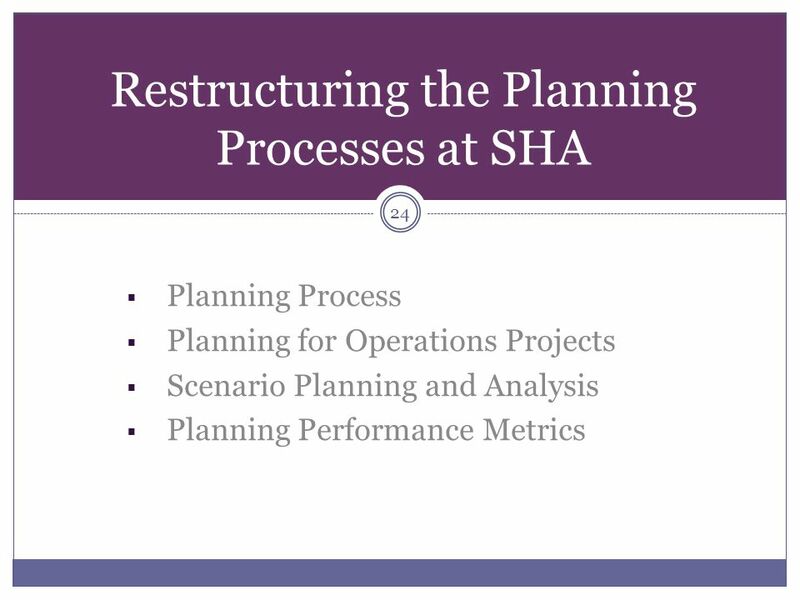 SHA will build on current efforts to refine the vulnerability assessment and focus on the Eastern Shore before broader analysis of the entire state is completed. 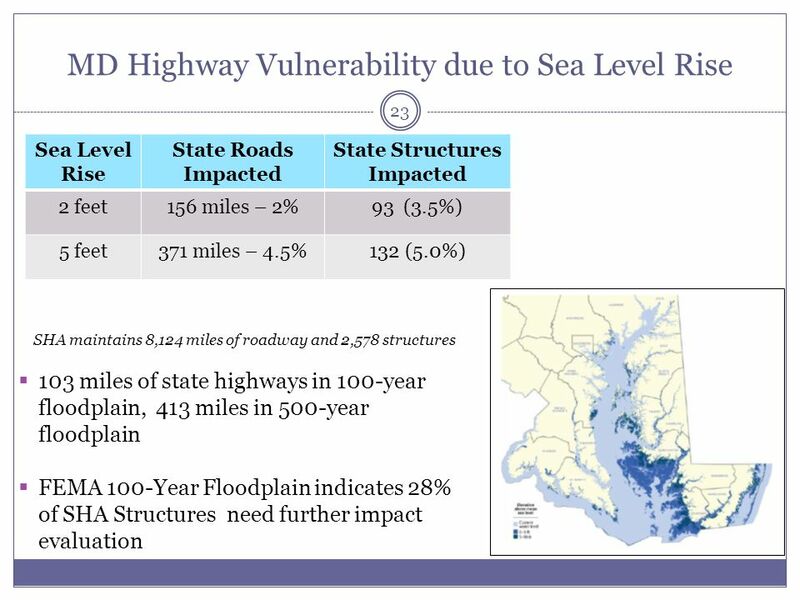 Studies on the Eastern Shore began in February and will start the process of identifying the types of drainage asset issues being seen now and the discussion of how to address them now and in the future. 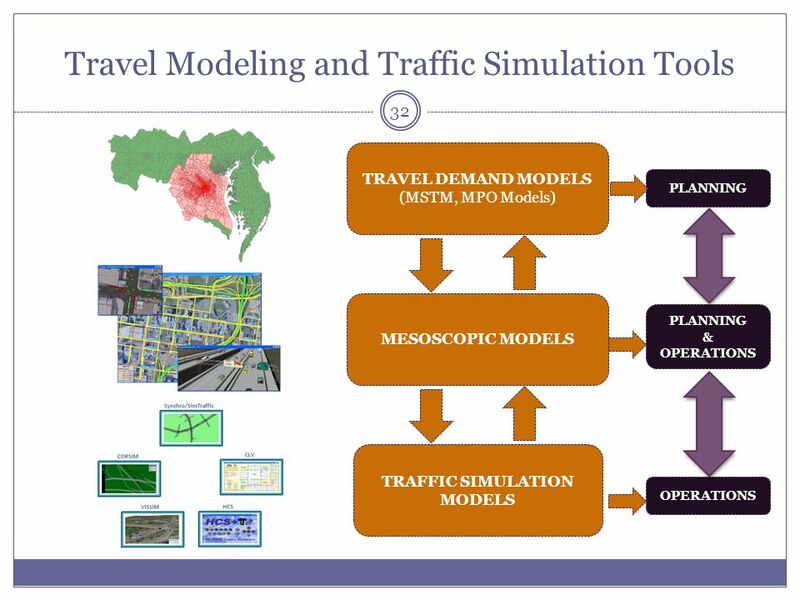 TRAVEL DEMAND MODELS (MSTM, MPO Models) TRAFFIC SIMULATION MODELS MESOSCOPIC MODELS PLANNING & OPERATIONS Mesoscopic models are a bridge between the traditional planning/ travel demand models and traffic operational models. 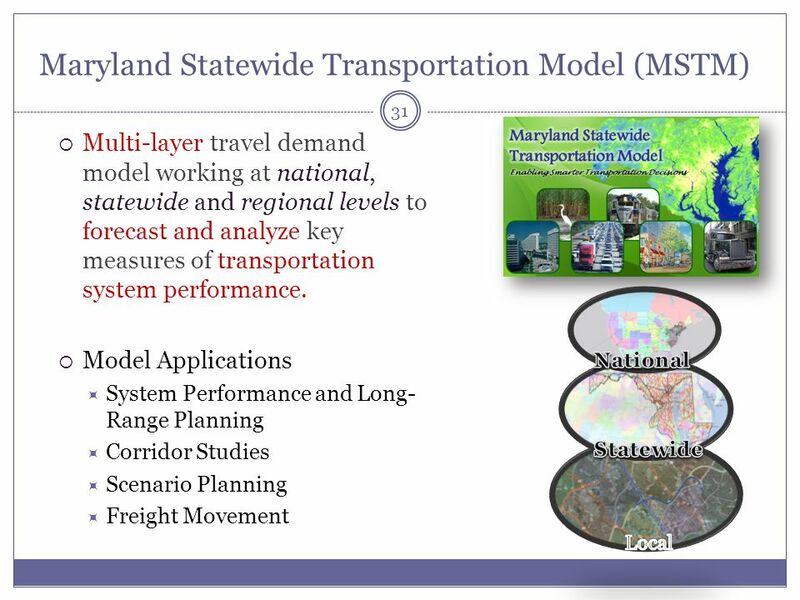 As you know the travel demand models look at the broader regional picture and the traffic operational/ simulation models look at detailed operations at an intersection/ segment level. 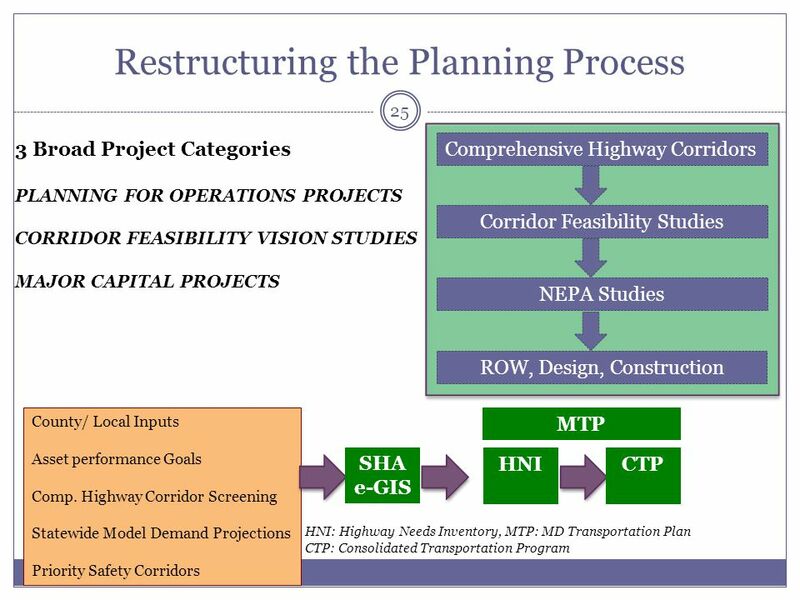 Typically, the planning models and simulation models don't talk to each other. This is where the meso-models provide the linkage by combining the best of both worlds. 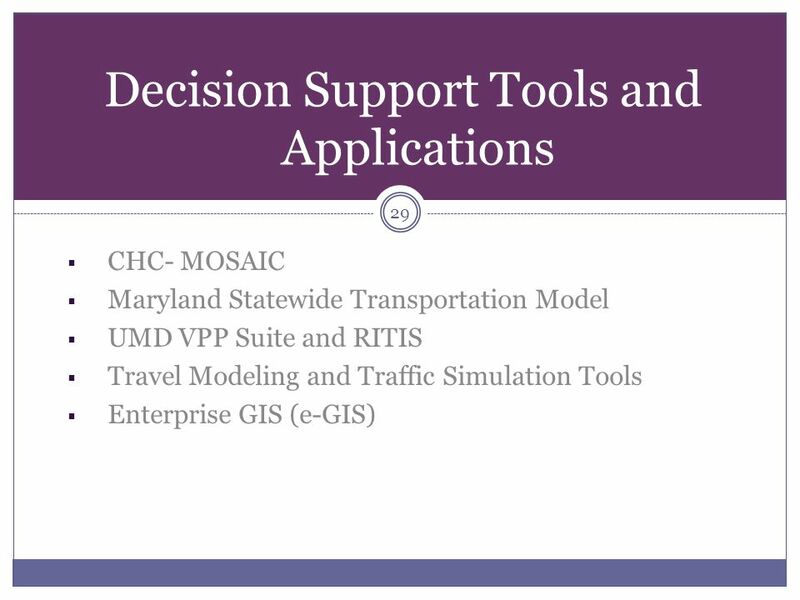 We take the origin-destination trip tables from the travel demand model and assign it on a traffic network. 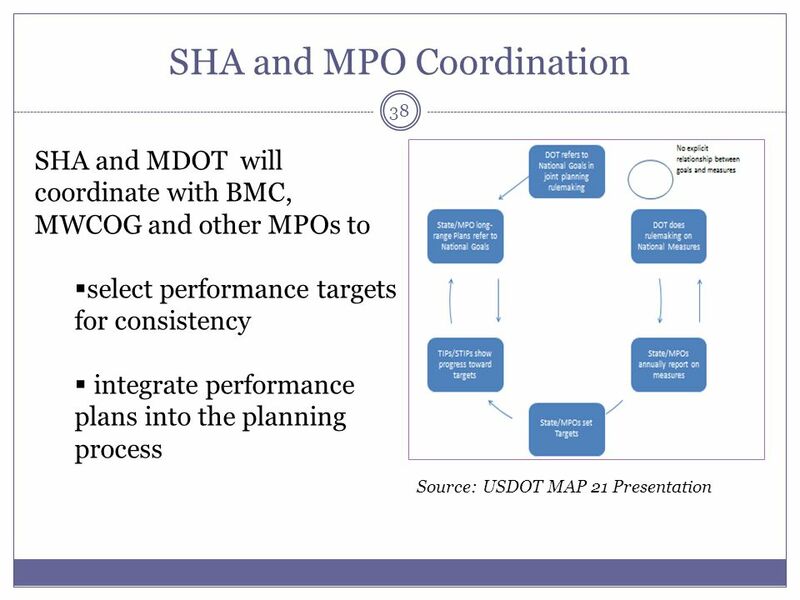 The meso-models have the capability to look at route diversion, departure time choice, mode-choice aspects of travel owing to congestion, pricing, incidents etc. 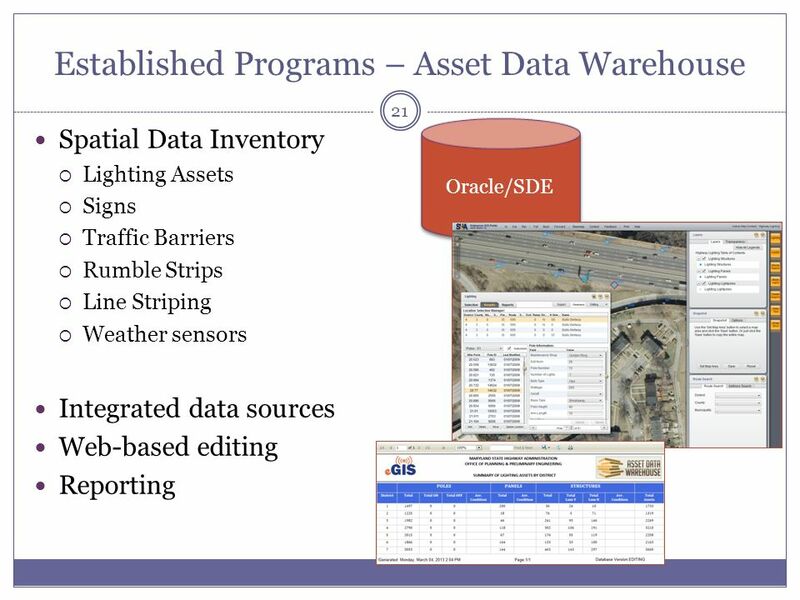 Therefore, we get more robust analytical capabilities for both recurring and non-recurring congestion. 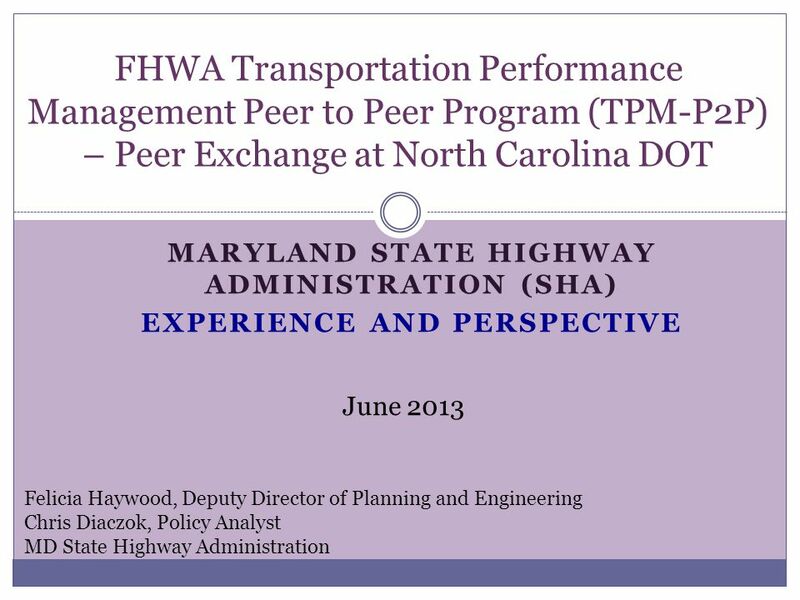 Download ppt "Maryland state highway administration (sha) experience and perspective"
Michigan Department of Transportation Michigans Infrastructure Needs and Funding 2013. 1 Roadway User Costs Nathaniel D. Coley Jr. Prefabricated Bridge Elements and Systems Work Zone User Costs Nathaniel D. Coley Jr. Federal Highway Administration. Transportation Day at the Capitol Jon Chiglo, Director of Engineering Services Minnesota Department of Transportation February 23, 2012. Green Mobility in Copenhagen Annette Kayser City of Copenhagen. Regional Routing Model Review: C) Model Formulation and Scenario Analysis Frank Southworth Oak Ridge National Laboratory Oak Ridge, TN NETS Program. 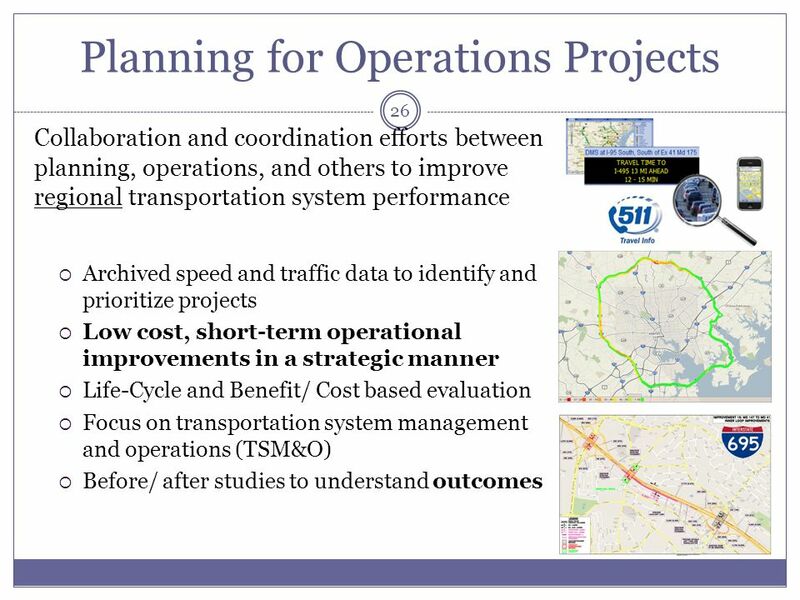 1 MAXIMIZING PUBLIC INVESTMENT Ohio Department of Transportation Highway Funding Overview Julie Ray, Deputy Director Division of Finance & Forecasting. 1 Incorporating Extreme Weather Risks in Asset Management Planning Lynn Clarkowski. Journey Management Nigel DAth Journey Manager Bay of Plenty RTIM Seminar 18 March 2014.